"The Charlie Brown and Snoopy Show" was a Saturday morning show that ran in '83 & '84. It was a direct lift from the Peanuts comic strips with nothing added except when absolutely necessary. You can kind of figure out what the three panels were if you try hard. It created some problems though: without Snoopy's thought balloons how were you supposed to know what he was saying since DOGS CAN'T TALK? So you lose a few punch lines. You also recognize quick that Peanuts rarely gave a happy ending. Who needs a happy ending? Things going wrong is always more fun to watch, isn't it? Free PEANUTS (If you act fast) ! Everyone knows that PEANUTS is one of the greatest comic strips ever, right? But did you know that NEW animated episodes of it are available for free download at the iTunes store. Better act now and get them onto your iPod, or your parents' iPod that is. We don't know how to link directly to the iTunes store (please tell us if you know how) so you have to click on this link and then click on the link there that will direct you and then download. But do it now because it is only for a few days! 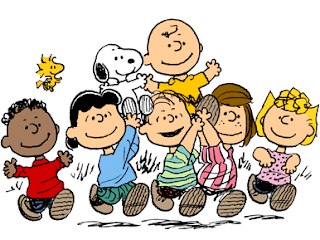 And check out the free online Peanuts library at the comics.com website.